There are two basic requirements for playing games on the PC. Your computer needs to have enough processing power to provide you with a satisfactory gaming experience, and if you play multiplayer, your ping should be as low as possible. If your ping or the ping of fellow gamers is above a certain level, you may experience latency issues while playing the game. A too high ping can have other ill-effects, like being kicked off automatically of servers that check player pings regularly to make sure ping's don't exceed a certain threshold. While games like World of Warcraft or Guild Wars 2 usually do not kick you for high pings, online shooters such as Team Fortress 2, the Call of Duty or Battlefield series often use the functionality to avoid player lags on servers. Reduce Gaming Latency (Ping) in Windows provided you with an option to reduce your ping in certain games by making changes to TCP settings of the Windows operating system. Especially gamers who have been experiencing pings of 100ms and above may benefit from those modifications, provided that their connection to the server should be faster than that. If the connection itself takes 100ms, you won't see a difference, but if it should be faster but is not, then you most likely will. If you do not like to hack the Windows Registry manually, you may prefer a program that does that for you. 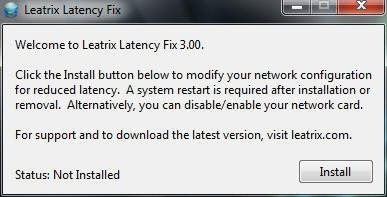 Leatrix Latency Fix is a free program for the Windows operating system that you can use to apply the changes automatically. All you need to do for that to happen is to download the latest version of the program from the developer website, extract the zip file to your local system, and run the program executable afterwards. The window displays the current status of the installation. A click on install makes the modifications to the computer and changes the status from not installed to installed. Please note that you need to restart the PC after the changes have been made for them to take effect. On Windows Vista and newer versions of the Windows operating system you may see an UAC prompt when making those changes. You also need administrative rights for the changes to be applied to the system. The program is fully compatible with all recent 32-bit and 64-bit editions of the Windows operating system. I don’t know whether this is placebo effect but it also improved my Team Viewer using responsiveness..
From my asia country to in US.. Does it help Counter-Strike ping also ? If no, do you know any other app to do that ? I can’t say unfortunately as I usually have very good pings already. I’d give it a try. If it does not work, you can easily remove the setting again from your PC to restore the old state. If you do, please let me know how it worked out for you. It was 34 before, and now 40~45. I’m in Aachen/Germany now to do some projects. I’m fairly certain that whatever this 5-megabyte-python-behemoth of a tool is doing, could also be done with a 5-kilobyte batchfile with netsh- and regedit-commands. i wish it will work for me ….